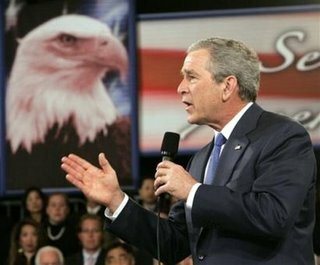 Bush, displaying a prototype of the “Freedom Eagle,” explains that the avian defenders will be fully authorized to conduct “swoop and poop” missions. WASHINGTON - Seeking to placate a conservative base clamoring for tough enforcement of immigration laws, President Bush unveiled a new weapon in the war to defend the nation’s southern borders: giant, man-eating birds. The President explained that the eagles had been in secret development by the Department of Homeland Security, in conjunction with the Pentagon, since 2002. The birds sport thirty-foot wingspans, with talons capable of holding 54 cubic feet, or six adults. They will be officially classified as the 1st Feathered Calvary Division. While the exact orders of the 1st Feathered Calvary are classified, the President mentioned that all responses are, “on the table,” and that the birds are allowed to devour man-flesh. The typical avian interception scenario involves the birds spotting suspicious groups of individuals moving across the border. The Freedom Eagles may then release excretory droppings at the individuals, as warning shots or to immobilize them. The birds, trained to spot green cards, passports, and other official identification, will scratch at the ground once to ask for proper ID. If the individuals do not produce it in a timely fashion, the Freedom Eagles will grab the perpetrator and fly him or her back to Mexico. If the perpetrator resists, the eagles are authorized to swallow them whole. “This is exactly the kind of tough law enforcement we need,” said political analyst Britt Hume. “And what better symbol than the eagle to put the white back in red, white, and blue. The President emphasized that the program would be safe. “If you're not an illegal immigrant, you do not have to worry about getting eaten by these birds,” Bush said. Whiting noted that, if the program along the border proves successful, the Department of Homeland Security plans to shore up the Canadian border with patrols of giant, man-eating moose. This link is getting emailed to my rightwing nutcase friend...now! HAAAAAA!!!! I love Clinton's and Frist's comments, and the regurgitation safe word. Oh my. Am also dropping in to say that when I linked to you this morning, I realized that I'd inadvertently left CJSD off my blogroll when I changed templates. I can't believe I didn't notice it until now. Sorry!!! Let's blame it on prego brain, shall we? "This is a nice try, but it seems too timid and humane to me. Birds, even the national bird, are too wimpy. Who's idea was it to stop their growth at 30 feet? A Democrat's probably. Look, we're talking about brown-skinned criminals taking away white jobs. Couldn't we genetically engineer a grizzly bear? Or come up with a land shark? My fear is when the terrorists hear that America is deploying birdies against its enemies, they will never stop laughing." We have just been informed that due to the President's relaxation of the Endangered and Protected Species Act that these birds have not been protected. As a result, the first experimental sortie was shot down by a gourp of Minutemen who seemingly are fond of hunting the big game. Our sources report the bird tastes "a little too gamey". Grendel, that's what makes the bird so perfect. Just when Al-Queda is laughing, it scoops them up and devours them in one bite, camel and all. If they are big enough to eat camels, too, then Buchanon is off his rocker. This idea rocks! Maybe we could get one sent to Iowa City and put it in a big cage on the ped mall, to educate the public. Ummm, Bush is about as open borders as they come. You should really see a doctor, your BDS is severe. Uglier than Tina Fey. Funnier than Howie Mandel. USDA Nearly Fires Official Over Concerns of "Blackness"
Sen. Jim Bunning: "I Will Kick a Puppy Until Congress Balances the Budget"
Top Ten Tuesdays: Why are we enriching uranium? Are you a Negative Newsie?